This Ritz 6-piece basic set of assorted dish cloths is a great value set for your kitchen, with both solid and check designs. Made from 100-percent terry looped cotton, these towels are highly absorbent. Each dish cloth measures 12-inch long by 12-inch wide. These dish cloths coordinate with the Ritz Royale collection, comprised of aprons, kitchen towels, dishcloths, checked kitchen towels, wonder towels, pot holders, Ritz Mitz, pocket mitts and cotton/neoprene oven mitts. Machine wash before the first use in cold water and tumble dry low. Value Pack. 6-Pack Terry Looped Cotton Dish Cloths in coordinated Solid and Checked Federal Blue designs. Highly Absorbent. Made of high absorbing looped terry cotton for premium moisture retention. Standard Dish Cloth Size. Measures 12"" long by 12"" wide; perfect for any kitchen! A Variety of Coordinating Colors to choose from. Our Ritz Royale Collection will complete your kitchen decor in style, without breaking the bank. VALUE PACK. 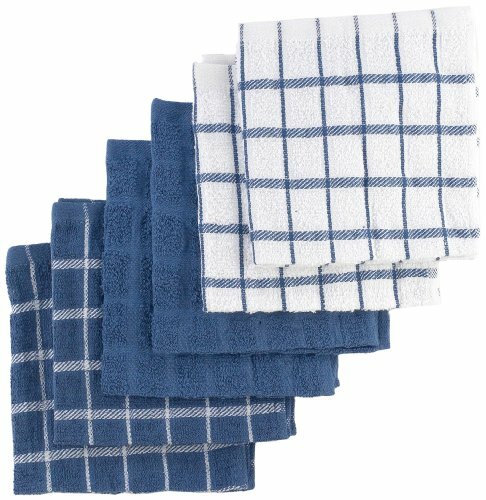 The Ritz set of six (6), 100-percent terry looped cotton kitchen dish cloths are a great value for all your kitchen and household cleaning needs without sacrificing the quality and durability Ritz is known for. HIGHLY ABSORBENT. Generously sized, each solid and check design dish cloth measures 12-inch long by 12-inch wide. Terry loop cotton construction made with a new woven technology. Perfect for wiping down kitchen surfaces or drying dishes. STANDARD DISH CLOTH SIZE. Each dish towel measures 12" x 12" and are designed and crafted with 100% pure cotton to stand up to everyday use in the home or kitchen. COMPLETE THE COLOR COLLECTION. When it comes to color, we've got you covered. Coordinate this dish cloth set with the rest of the Ritz color collection of aprons, kitchen towels, dish cloths, pot holders, oven mitts, and hot pads. If you have any questions about this product by Ritz, contact us by completing and submitting the form below. If you are looking for a specif part number, please include it with your message.